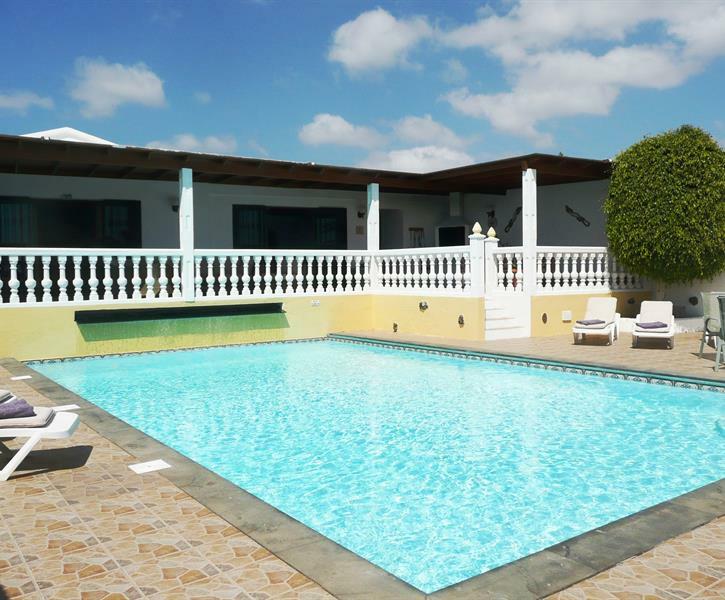 Casa Cielo is a spacious 4 bedroom villa with a larger than average private pool. This lovely villa is located in Los Mojones and is very close to all amenities:. Master bedroom- very large room- king size bed, en-suite with bath and shower over, basin, WC Bedroom 2 - double bed, en-suite with walk-in shower, basin, WC Bedroom 3 - twin beds Bedroom 4 - twin beds Family bathroom - bath, walk-in shower, basin, WC Outside: table tennis, table football Private heated salt-water pool 10m x 6m in size with cover and steps for entry. Solar heated in summer, electrically heated from November to April inclusive. Pool covers should be kept on when the pool is not being used for long periods. Using the pool cover overnight is essential as the water temperature can drop as much as 6 degrees whilst you are sleeping. Shower room with separate WC Villa cleaning & linen Villa will be clean for your arrival and the beds will be made up. Stays of 11 - 14 nights - the villa will have a full clean & fresh bed linen. Staying for 10 nights or less and want extra cleaning and bed linen. Contact us for a quote. Bath, hand & tea towels will be changed every 3 or 4 days for all stays. One pool towel per paying guest is provided for the duration of your stay (not changed but can be self laundered) Extras in the villa include safe, and welcome food pack of tea, coffee, sugar, juice, water and milk. This is one of my favourite villas situated not too far up the hill in Los Mojones within easy walking distance of a good variety of supermarkets. The villa is always very clean and the lounge furniture is comfortable. There is a wide range of seating provided outside so you can always find a comfortable position in our out of the sun or wind! The pool is exceptionally good having vertical sides and sloping gradually to about 6 feet which suits less confident swimmers as well as the more able. The pool temperature is good provided you replace the cover overnight - which does require some effort since it is a large pool. There are lots of showers and plenty of hot water and towels provided. There is a wide screen television but don't expect much more than Sky News,better to bring your own DVD's. There are a good selection of restaurants down by the Port area and if you can't face the walk back up the hill a taxi can be readily had for 4 Euros with a tip. The villa has an electric gate which actually works and is very secluded. The local representatives are helpful but unobtrusive. They are there if you need them and having a native spanish speaker like Erica available is invaluable as I found out after I wrote off my hire car. On that latter point I found the Police, Hire Company, Insurers very easy to deal with and no drama. Drive carefully and enjoy the beautiful island of Lanzarote.